With an increasing evidence base, emergency ultrasound (EMUS) is soon to be introduced into South African emergency departments. As with any diagnostic apparatus, there are areas where its use is particularly helpful and areas where it is not. Successful EMUS depends on binary (yes/no) decisions in life-or-death emergency medicine situations (e.g. 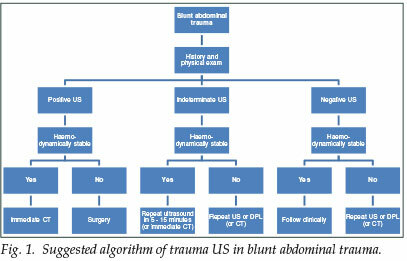 trauma, abdominal aortic aneurysm (AAA) and cardiac arrest). As its introduction will change established treatment options, discussions have arisen about safety, alternatives and who should perform it; given the large number of generalists employed in the emergency medicine sector, the practitioners are unlikely to be radiologists. We evaluate the evidence from sites where the practice of EMUS by non-radiologists is considered to be established. EMUS practised by emergency physicians differs from the US practice of other specialties. It provides information through rapid, non-invasive definition of critical anatomical structures. Performed at the bedside, it forms part of the clinical examination comparable with bedside tests such as the ECG. Its aim is to answer a goal-directed question with a binary (yes or no) answer, rather than a spectrum of queries. It does not replace computed tomography (CT) imaging, magnetic resonance imaging (MRI) or formal US, as it is not as sensitive or specific. It does, however, provide time-critical and clinically important information at the point of care - without interrupting the resuscitation - that can only be matched by including radiology expertise in the trauma team. Given the vast incidence of major trauma in South Africa, the unavailability of after-hours radiology at most public sector emergency departments and the distance between facilities, radiology-led US is unlikely to become the norm. Emergency physicians appropriately trained in the use of EMUS would then provide the best practice. 1. Is free fluid present in the peritoneum or pericardium or pleural space? 2. Is a pneumothorax present? 3. Is an intrauterine pregnancy present? 4. Is cardiac activity present? 5. Is an abdominal aortic aneurysm (AAA) present? Detection of AAA in an unstable patient would confirm a decision to proceed to surgery in patients presenting with an abdominal mass or pain, flank pain or back pain associated with hypotension, shock, syncope or near syncope.35-37 As with early pregnancy US, sensitivity is improved through detection of free peritoneal fluid. • continuing medical education (CME). Thirdly, radiologists are better than non-radiologists at AAA assessment and trauma US. While this is true, there is no significant difference in interpretation when the aim is to give a yes/no answer to the goal-directed question of whether free fluid or AAA is present.35,39 Competent AAA assessment can be successfully achieved by non-radiologists for screening purposes (oral communication, 24 July 2008, P Dubbins, Department of Radiology, Derriford Hospital, UK). Introductory courses were held in 2007 at the Emergency Medicine Society of South Africa's (EMSSA) conference on emergency medicine in the developing world; further courses were held in 2008, and more are planned. The EMSSA and the South African College of Emergency Medicine are working towards a policy on EMUS including the adoption of accepted international practice, which supports the development of emergency medicine as a specialty in a resource-poor country. We invite readers' comments on this topic.